Adhere to the safety guidelines below to get the best results using Bustar nonexplosive demolition methods for your controlled demolition project. From pump pads and curbs to baghouse modifications, from pre-splitting to rock breaker for fracturing cuts, from limestone rubblization to block separation, from building demolition to small-scale concrete removal, we provide you with the safety information you need to use Bustar with confidence. Safety guidelines when using Bustar for building demolition, rock / concrete demolition, and all other controlled and selective demolition applications. Always protect your sight by wearing quality safety goggles. This is a highly alkaline product, similar to portland cement in chemical composition. Should the product come in contact with your eyes, flush eyes with water immediately and consult a physician. Always wear rubber gloves to protect skin from exposure to this product. Should the product come in contact with skin, rinse with water, wash with soap and rinse. If irritation persists, consult a physician. Always wear a particle mask while mixing and pouring this product. Inhalation or ingestion of this product produces the same symptoms as cement or quicklime. Do not eat, drink, or smoke during mixing or pouring. Exposed clothing should be removed. Do not look directly into the poured hole during the first ten hours. A blowout may occur. A blowout is caused by improper use of this product. To prevent a blowout always follow guidelines and procedures. A blowout may occur three or more times. Do not go into the affected area. Observe safety rules and recommended precautions. Core temperature and hole diameter will determine the correct product. Always use clean, cold water. 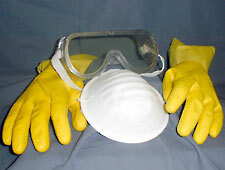 Always wear safety goggles, gloves, and a particle mask while handling product. Never look directly into poured hole. Barricade and stay out of poured area for ten hours. Use proper hole pattern for your application. Never use this product for any purpose but cracking rock or concrete. Safe demolition methods for building demolition, nonexplosive expansive concrete demolition, and other controlled demolition settings make for better outcomes. Always review the safety guidelines and MSDS before using expansive grout concrete splitter and rock breaker technology.